In the previous blog post the term dynamic was used to describe the type of stretches that should be done when warming up. But isn’t stretching just, stretching? Well, there is a little more to stretching then just bending down and touching your toes. There are actually seven different types of stretching, with the two main forms being static and dynamic. Knowing about these two forms of stretching is important in ensuring that you are stretching in a way that is beneficial to performance and reducing the risk of injuries. Dynamic stretches involve moving parts of your body and gradually increasing the reach, speed of movement or both. The movement should not be bouncy or jerky and should not force the body beyond its range of motion. Static stretches involve reaching a point of tension and then holding. For example, reaching for your toes to stretch your hamstring and holding the stretch. This form of stretching does, however, decrease eccentric strength for one hour after, decreases force by 5% and decreases the rate of peak production by 8%. 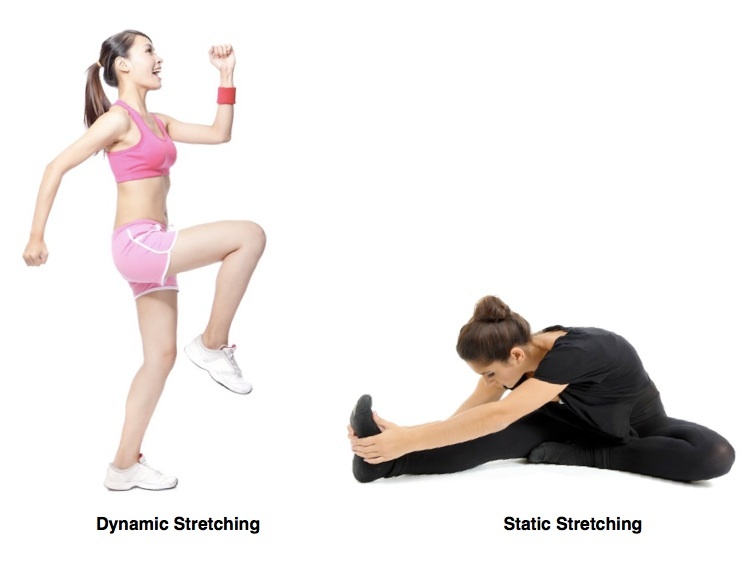 Therefore, static stretches are best performed after activity and can be done with cool down activities. Choosing the right form of stretching for specific exercises can greater reduce the risk of injury occurring from exercises. Previous Why Warm up and Cool down?